This could be a game-charger for future Mars missions. NASA and private companies like SpaceX are busy planning Mars missions, but only have a vague idea of how they're going to find critical water supplies. Now, using the Mars Reconnaissance Orbiter (MRO), researchers have discovered abundant, easy-to-access H20. A survey found no less than eight sites where cliff erosion has exposed thick deposits of nearly pure ice that lie just three to six feet below rock and dust. The findings mean that future missions, both manned and robotic, may have an easier time than expected digging up water for drinking and making rocket fuel. "The discovery reported today gives us surprising windows where we can see right into these thick underground sheets of ice," study co-author Shane Byrne of the University of Arizona told NASA. "It's like having one of those ant farms where you can see through the glass on the side to learn about what's usually hidden beneath the ground." 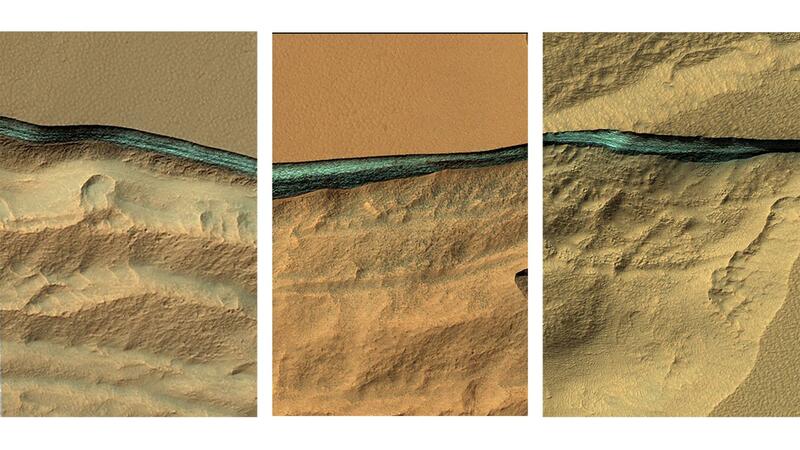 Researchers found the scarp sites by gauging colors using the High Resolution Imaging Science Experiment (HiRISE) camera on the MRO, and confirmed its purity using CRISM (Compact Reconnaissance Imaging Spectrometer for Mars). The orbiter has previously found extensive ice sheets at other locations on Mars using its Shallow Radar camera, but it was impossible to say how deep it was. Now, scientists know that it's close enough to access with relative ease. Another study had scientists concerned that the soil itself doesn't contain much water, but that may not be as much of an issue if it's abundant in ice form just below the surface. At the eight sites, there are even areas where ice water is directly exposed. "Astronauts could essentially just go there with a bucket and a shovel and get all the water they need," Byrne said. Besides the practical aspects of water-fetching, the findings have important scientific value, too. "There is shallow ground ice under roughly a third of the Martian surface, which records the recent history of Mars," said Colin Dundas, the study's lead author. "What we've seen here are cross-sections through the ice that give us a 3D view with more detail than ever before." For instance, Mars' climate is highly variable because, unlike the Earth, its tilt changes a lot more often. Researchers noticed variations in the color of the ice in individual scarps, suggesting that it formed differently at different times, depending on the tilt. "If you had a mission at one of these sites, sampling the layers going down the scarp, you could get a detailed climate history of Mars," said MRO project scientist Leslie Tamppari. The finding is one of the most exciting around Mars water to date, but it's not definitive proof that massive ice blocks exist below the surface of Mars. On top of that, researchers can't tell if the water has high amounts of salts or, worse, poisonous perchlorates. However, it gives scientists a much better idea where to send future robotic missions, which could access the ice directly and tell us all we need to know.